My first and so far still only serious use of 3 layers of stacked shapes. I love the result of it. This is a milestone for tilings because of the screen-filling hypnotizing tiling with a morphing in the center that connects to the tiling in a natural way. This is related to the idea to transform a tile-pattern into a tree. I described the idea in the description of Lattice evolution. Because the required depth is too extreme, it can't be done. My new idea is to skip the part of building a Julia set approximation to make a tree out of, by using existing the properties of the tiling to make a tree out of it instead. What I realized it that a Julia set is not necessarily an absolute requirement to create a tree. While a tree can be created from a Julia set, there might be other structures that can be used. If such structure can be the tiling itself, the depth can be low enough. So that's what I tried to do. It worked and the result is this. It's a tree where the space between the branches is filled with tiles connected to the branches. It doesn't look quite like I hoped though. It's hard to see where the branches are. It just looks like a chaos of tiles. My name is Dinkydau. I started using Apophysis somewhere in 2007. I discovered it on a forum. Someone on that forum had an Apophysis fractal in his signature. I asked him how he made that, and he said he did it with Apophysis. So I downloaded Apophysis and started working with it. In november 2008 I started to do animations and I joined deviantart. At the moment I don't make flames anymore. 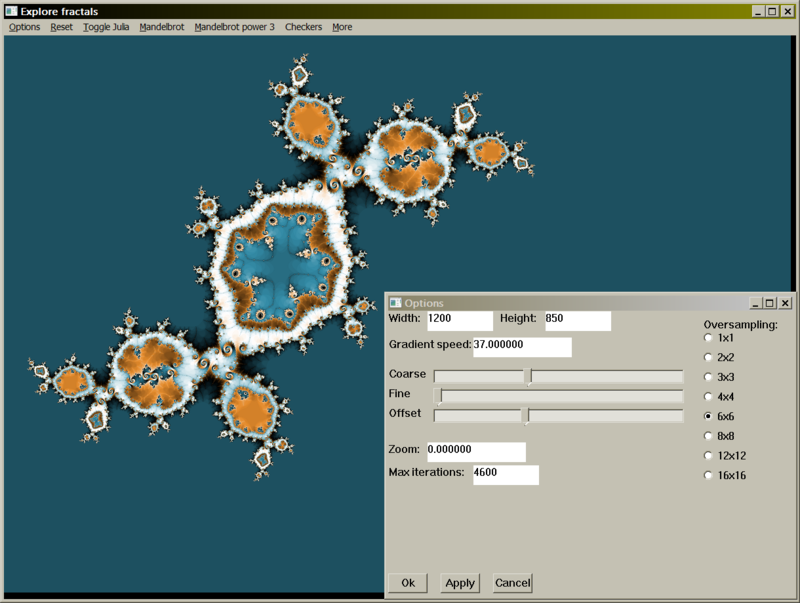 In early 2012 I started to focus on exploring the mandelbrot set in the program Fractal eXtreme. 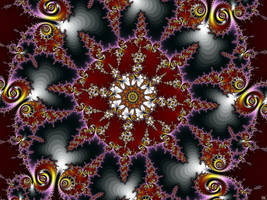 I knew about the mandelbrot set before, but it's extremely computationally intensive to explore compared to flames, so I focused on fractal flames at first. Technology and algorithms have improved and I saved up money, so I bought a nice computer. Now I'm focused on finding and rendering mandelbrot locations. Personal Quote: The world seems complex, but that's just because we're part of it.